One of the funniest writers, one of the most perspicacious observers of the political scene, and one of the most dearly loved proponents of truth in the midst of muck, Molly Ivins died tonight. Ms. Ivins' pieces were a joy to read and for those lucky enough to see her occassional public appearances knew she spoke as clearly and humorouosly in vivo as in print. Her measured handling and dismantling of the porcine Bill O'Reilly at a book fair in 2003 was delicious. She will be missed, especially in these days of soft journalism. Not too many columnists left with the ability to chew on an issue and give us the essence, and always with wit. A salve for the unpleasantries. Here are 2 fine tributes to her passing. One from Jim from ArchaeoTexture. The New Yorker: Where's the Fact Check Dept.? This week's issue has the following cartoon on page 4. 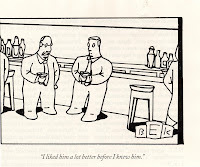 In fact, it's the first cartoon in the magazine. Notice anything? 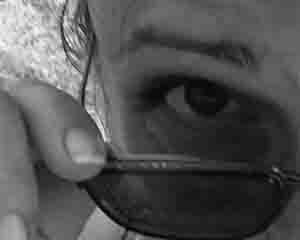 Click! for a larger image. That's right! The Arctic-Americans in this country are being mis-represented. As everyone knows, all the species of penguins live south of the equator. 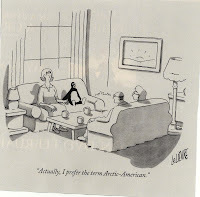 We're talking Anarctic-Americans, here Mr. Glen Le Lievre! As we all know, it's the vanishing and going-down-the-road to extinction polar bear that can qualify as an Arctic-American if one chooses to saunter down from the icebergs up North and cross Canada to come here. Poor Searchie. As one of her first acts of being a professional writer, she has run into the infamous comb-over humor-challenged void-of-personality accountant. Personally, I count myself quite lucky as most of the accountants that I've met, dealt with professionally, and befriended have been quite interesting, if not downright off the deep end, at times. Most have been women, as Accountancy has been more hospitable and open to that half of humanity than have other professions like engineering, law, and even medicine. Sounds like she just ran into one the unfortunate relics of old-tyme accounting, the socially inept polyester suited guy. Hope she gives it another shot, as there are CPA's out there who are quite interesting people who also happen to know their way around a spreadhseet and a GAAP manual. She just hasn't had the good fortune to meet an accountant who keeps some Kozy Shack Rice Pudding and Slivovitz buddy-buddying in the fridge. It's Sunday the 28th of Janaury. Can't believe the 1st month of 2007 is almost history. The time, it's not being checked through security for its flight. Just sitting here at the station doing one of this year's radio shows. It'll be a jazz/blues version today. Weather is that blueish-grey that hopefully means snow. So, that usually means the listening audience is a bit larger. I'll be posting the playlist later this week. Few selections from the Holmes Bros., some Ry Cooder, Janiva Magnes, Louis Armstrong (always great to hear on an overcast day), Michael Carvin, Galactic (who are going to be in Philly this Thursday! Got tix in hand), Shuggie Otis, & Dr. Lonnie Smith. Other folks will be fitted in as well. As per the usual you can catch it live, from 9:00 to 12:00am EST, here. This blog, A Theory of Ice, has been on my weekly chumming list for a while. An excerpt from a recent posting will give you a hint of the unidentified writer's talent. "Never underestimate Buffalo. The Sabres are, iceberg-like, infinitely more complex than they appear on the surface. If there was any justice in the world and hockey had the audience it deserves there would be lengthy tomes of Sabres-theory all over the bestseller lists, philosophers and anthropologists would be having symposia about them, there would be novels and movies devoted to them. They are that interesting. However, life isn’t fair and hockey doesn’t have much of an audience, and therefore the only really important thing is the conclusion: Never underestimate the Sabres. If you are any other team in the NHL, no matter what kind of a lead you get, always play Buffalo as if you’re one goal down in the last five minutes, because they will punish nothing so rapidly as complacency. If you love hockey, the purest of the major sports (although folks will argue that hockey is no longer a major sport since it gets outdrawn by "Cheerleaders from Hell" competitions on ESPN), I'm sure you'll aprreciate Mr. Ephemeromorphia's writing and analytical skills. It certainly doesn't hurt that he's a loyal Canadiennes fan, a team I used to favor until the dark day that they left the Montreal Forum for their new (and current) digs, the Bell Centre. 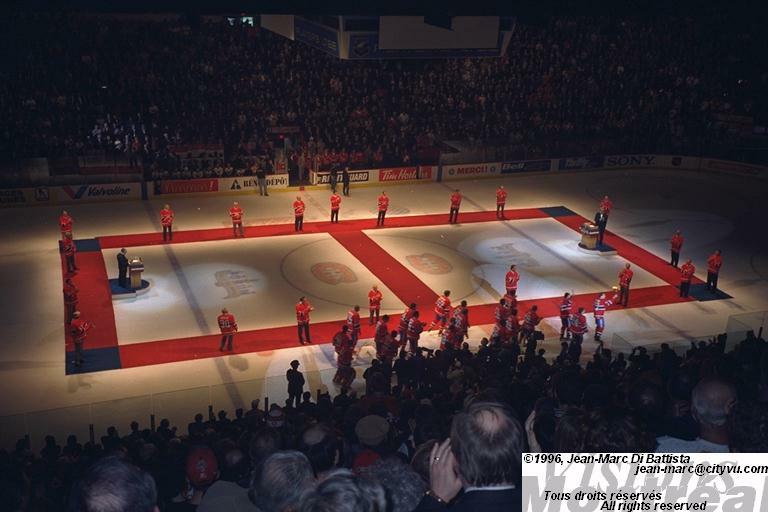 For me, they stopped being the Les Habitants that day and simply another team in skybox land. Nonetheless, this blog is well worth reading for the deep-thinking and fine writing done here. Dare I say the blogger may be hockey's Roger Angell? A tip of the helmet to Our Girl in Chicago from Arts Journal fame for pointing out A Theory of Ice a while back. Being in Chicago, I've got to believe she's a Blackhawks fan; I would not have expected such kindness to be shown to a Habs fan. Must be her appreciation of the well-turned phrase that led her to this fine gift of charity. Click for larger image & legibility !! She was quite gentle and justifiably firm. Without using words running along the theme of intruder, remora, stalker, she made the central point valid by simply asking, "Why?". You get the hoofdgedachte. I was, in effect, the shucking knife approaching the oyster. With a tinge of malintent. So, with a clearer head prevailing and (hopefully) no long term effects from this malapropos action, I'm deep-sixing the Yoin-Ta blog. It was a perfect example of good intention resulting in bad action. This song, a jazz standard composed by Fred J. Coots and Haven Gillespie, is one of my favorites. (Note: This songwriting duo is also responsible for "Santa Claus Is Coming to Town"). For a long time, this version rendered flawlessly by Louis Armstrong and Oscar Peterson was the one that always sets me into a different world. The opening 2 minutes is simply the most beautiful music I think I'll ever hear. Then this release by Brandford Marsalis' record company, Marsalis Music, featuring Michael Carvin on drums and supported by Dezeron Douglas on bass, Carlton Holmes on piano, and Marcus Strickland on sax came out late last year. Mr. Carvin's take on You Go to My Head is different. It's a much longer version, almost 12 minutes (11:49), when compared to the Armstrong/Peterson 6 minute version (6:22). For the first 2 minutes or so, a quiet tense interplay between bass, piano, and drum give you no clue as to what song is being played, unlike the Armstrong/Peterson version. On my first listening, just as I thought I'd reached a tipping point of annoyance, Mr. Strickland breaks in with the langorous beginnings, on sax. Mr. Carvin switches to brushes and sweetness prevails. Still have the Armstrong/Peterson on the top pedestal, but Carvin's rendition is only a step below. Guaranteed to melt you into your sofa. An appropriate time to take your spouse into your arms for a (finally! It's here!) winter snuggle cuz she/he goes to your head. The rest of Marsalis Music Honors Michael Carvin is just as fine. His rendering of Dizzy Gillespie's "A Night in Tunisia" is a jolting poke-your-head-up-and-notice drum-kit-beating version. Lots of excitement and then application of the brakes followed by more pedal to the (drum) metal. Fine turns on solos by all of the previously named crew. An enthusiastic recommendation for acquisistion of the cd. A new blog is here. Yoin-Ta. Please take a look at it and let me know if I'm way off base. Especially you, Searchie. Its intention is not to affect the entries of Searchie but to serve as an informal gathering/sharing of her blog's readers. The only entries that will be posted to Yoin-Ta will be links to her postings that would allow one central place for readers' comments and conversation extensions prompted by her entries. Hopefully, it'll be the pool we all come to sip at. Can't say if this guy, Ivan Hrvatska, is even somewhat real or simply a fellow who just missed the SCTV circuit. The self proclaimed "SLAVIC LOVER, ROCKER, AND CAPTIAN OF THE CROATIAN DRINKING TEAM SINCE 2002" leaves modesty in his wake. The "discovery" of this guy is totally credited to The Fake South Shore who, I think, hits it on the head when he proclaims Mr. Hrvatksa (translated as Mr. Croatia) to be Canada's version of that Borat guy I've been in a funk about the last 2 months. Hopefully, Gospodin Hrvatska will not go into films. His self-penned songs all have the phrase "Make(ing) Love to" within their titles, overdosing one to the concept of Love in whichever forms he casts them in. I don't think this is going to go well with the Croatia National Tourist Bureau. Here's Ivan sending out Christmas Greetings. Never too late...or early. Sisiggy, blogging as Linguini on the Ceiling and also known as Jeanne Jackson when she's writing here, posted a piece back in early December titled, quite appropriately, "Crying Out Loud". Short version. Her bruiser of a husband, lovingly labeled Dirtman, is, like quite a few guys (I raise my hand hesitatingly here), a domestic weeper. Quoting Ms. Jackson, "Dirtman is a pretty tough husband. He works outdoors in rough terrain in all kinds of weather. He is the killer of all that is creepy and the cleaner of all that is disgusting. During any crisis, he gets busy behind the scenes, doing what needs to be done while everyone else is panicking and falling a part. He is particularly vulnerable during the holiday season. You can’t turn on the television or go to the movies without something cloyingly sappy popping up before you. She goes on to note that "...stoicism is not Dirtman’s strong suit, though, and I know he gets pretty embarrassed that something as innocuous as a TV ad is all it takes to set him off. He’s blocked the Hallmark channel on the satellite feed so he can be sure that while channel surfing he won’t be faced with that little boy singing O Holy Night by himself until the brother he’s been waiting for to make it through the blizzard begins singing with him from the doorway. (If Dirtman is reading this paragraph, be assured he’s is now wiping his eyes. He can’t even talk about that commercial.) "
I found myself reaching for the box of T's, when she mentioned the Bing Crosby song "We'll follow the Old Man.." from White Christmas. Can't count the number of times that I've seen this movie, and yet this song gets me every time. "Getting some more chips and salsa, right? ", they throw in my general direction as I pick myself out of the futon to leave the room when the whistling in the Vermont inn commences. Good Old Dad, humbugger extraordinairre, being undone by a sapola of a musical number. Each year. Each time. Ms. Jackson makes some great points illuminated by her family's dialogue and her Jersey bite. The only thing I don't agree with in her piece is when she says that "Guys from the Shenandoah Valley put a lot of thought into this sort of thing (Acceptable Moments of Men Crying)". I would change the Shenandoah location to worldwide. Hey! We're human. We've got all of that salty water sloshing inside of us and sweating can only get us so far as far as expelling the liquid is concerned. This past season's new introduction to the Holiday Tear Festival was Family Stone. A two-boxer. Look, I'm just trying to spin a laugh or two from what could have been a serious situation. Luckily, no one was injured or killed. Timing was certainly an issue. It just seems that this attack is an indication of how serious terrorists are in rending asunder the fabric of our American lives. While our smart bombs/missles have been targeting on military facilities or enemy hideaways, this incident indicates a dangerous uptick on the terrorist agenda. Their smart missles will now be targeting our indoor plumbing. What better way to disturb our national psyche than to threaten our way of life, our room of deep thoughts and solitude. Indoor plumbing, large ornate bathrooms, heated floors and toilet seats, and porcelain thrones are things we take for granted. Places we assume are safe from family bickering and turmoils and terorist missles. Alas, another brick in our wall of safety has been loosened. We are now on a hot seat of discomfort. 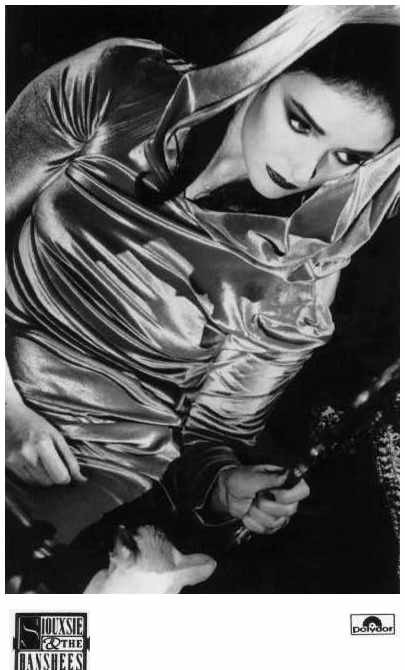 In her most recent post, Searchie has let her reading public know that all signing appearances, when her book is published, will be made by her body double, Siouxsie of Banshee fame. Since Siouxsie and her Banshees have gone their seperate ways back in 1996, job opportunities have been slim for Ms. Susan Ballion. But now, with the possible release of Searchie's book in the coming years, we may once again be subject to the "ruby red lips, kabuki pallor, blackened raccoon eyes" that the punk-chanteuse Siouxsie had brought back from the earlier decades of the 1900's. The reclusive Searchie, wrapped in her many veils of mystery and intrigue (is the number past SEVEN at this point? ), has once again displayed her wit and her savvy. For those of us who, aside from not being able to leave appreciative comments on her blog (Yes! I was given a window of opportunity one short time ago and I, like Carlos Beltran this past fall season, choked from the weight of the gift), had thought we'd actually meet/see her when the de rigeur author-signing tour came up...??? Well, seems we will all be skunked. Searchie, ever one step ahead of her curious readers, seems to be suggesting that Siouxsie has enough physical qualities to do a Searchie stand-in. How clever is that? Searchie will most certainly cloak her name as author. Why not continue the Vida Misterioso with body-double public appearances? I'm sure Siouxsie will be appreciative of once again being in the public eye, and an educated public eye at that based on the high quality fo Searchie's blog-writing. Both would be winners as would we, her readers. Searchie's guarded mysteries would remain as such, which is a very good thing. In these too modern times of blogs, sans-underwear wearing, & helicopter-flying papparazzis buzzing weddings, preservation of mystery is a rare state of affairs. Just a quick note. Currently (09:24 a.m. EST)doing one of the regular shifts on early Sunday morning at WVUD. Playlist to be posted later today, here. Heavy on the jazz piano today. Mehldau, Charlap, Tyner, Rebbenack (come on, come on...you know who this is). Throwing on some selections from Orphan, Tom Waits' latest. Man, he does have me in a non-communicative funk. Update: Playlist for the show is located here. It's the 4th of January. No fireworks. I've been a sluggard the last week, reminiscing (still) over the last year's happenings. Still quite bummed out about how disappointing Borat was. Why dreg up old ghosts? The family watched an older DVD, SCTV Christmas. One of the old bits was a dock-you-men-tary of the Shmenges' Christmas. Traditions of Christmas in Lutonia are carefully explained, all with humour and no mis-treatment of animals (or our good senses). Couldn't find that particular bit on YouTube, but here's a short Shmenge bit for acquaintance or re-acquaintnace purposes. Or this The Last Polka and subsequent in-depth interview, with David Letterman...a very young David Letterman. Yosh Shmenge lets Dave know that "(Lutonia's) located on the dark side of the Balkans. ", thus explaining their situation. This last YouTube clip is especially entertaining to see; just watch Eugene Levy's facial contortions. Mr. Levy's blessed with the most lively eyebrows since Groucho Marx. His talents were so well-used during the days of SCTV. It's almost criminal how little his capabilities are being used now (with the exception of his Christopher Guest movies). Almost as criminal as what Sasha Baron Cohen did to his creation Borat. We were awating the new year on Dec. 31st and a short weather announcement came. It was around 9:30 at night and the temperature was 34 degrees Fahrenheit. The temperature was predicted to go up to 50 degrees that night. I shook my head and asked some of the other folks if I had mis-heard. It was 9:30 at night and 34 degrees and the temperature was going up??! Look, not having any snow as of yet (apologies to Colorado and its many feet of the white stuff) was a bummer. But, for temperatures to be increasing as the night got darker? That seemed beyond physical science. Al Gore must be laughing his head off. 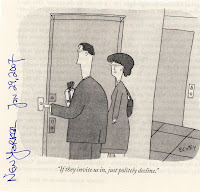 So, apologies to my patient readers who seem to be enlivened by the new year. I'll be there with you shortly (including finishing that Tom Waits' Orphans review) shortly. Meanwhile, please, enjoy the Shmenges.